Today I want to showcase the wedding bridal flowers that I have designed last week for Michelle and Yu’s wedding. Michelle came in 3 months prior her wedding to tell me about her wedding color theme – Lavender & Purple. She would love her bridesmaids having the same bouquets as hers. 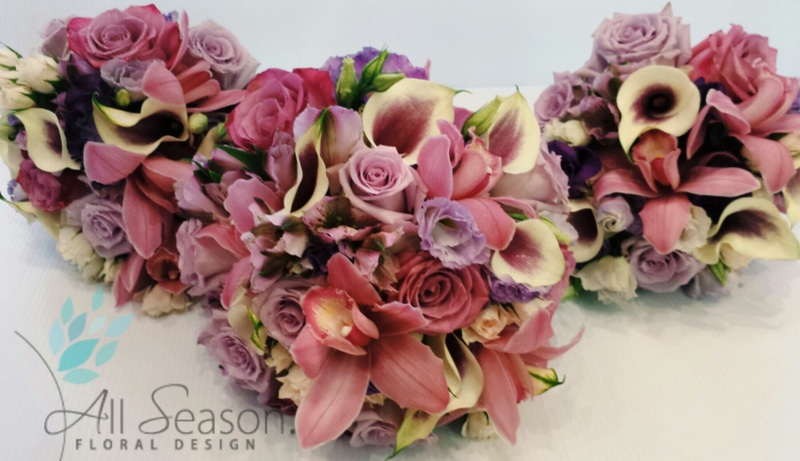 The bouquets were designed with lavender and pink roses, Picasso calla lilies, different shades of lisianthus, alstroemeria and cymbidium orchids. The handles were tied with ivory & lavender ribbons. The bouquets were in the traditional round shape. Rose is always the most popular option of wedding flowers. For a summer wedding, I actually do not recommend using ROSES in your bouquet because of the high temperature. It is going to kill the flowers! You do not want your bouquet wilted before you walk down the aisle. 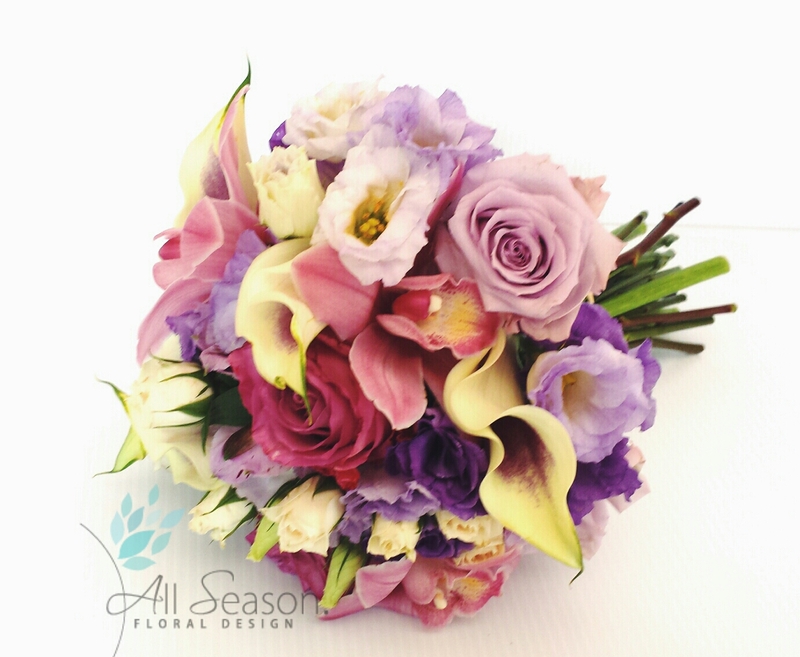 Using heat tolerant flowers, such as calla lilies and cymbidium orchids can make the bouquet last for a whole day. However, I did incorporate few stems of rose in Michelle’s bouquet because the color and shape of the blooms were perfect match with other flowers. 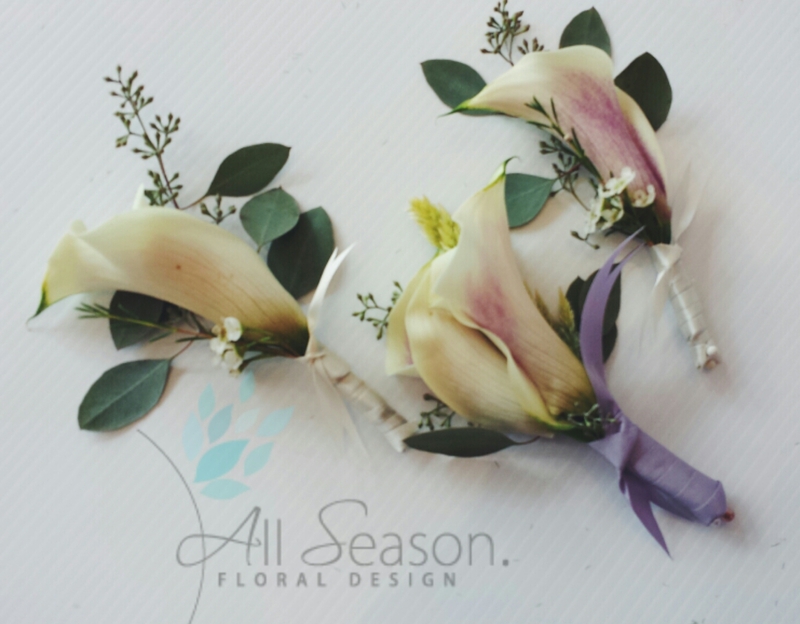 The Groom’s and Groomsman’s boutonnieres were designed with Picasso calla lilies and euca seeded. I love Picasso callas because they have bi-color blooms – cream and purple. How lovely they look! The stems were tied with coordinating cream/lavender ribbons accented with single knots. I also designed the Father’s boutonnieres with green cymbidium orchids accented with ferns and Mother’s corsages with pink cymbidium orchids accented with pearls and rhinestones. I feel so fortunate to be able to do what I love while making my client’s vision come true! 21 Jul	This entry was published on July 21, 2014 at 9:54 pm. It’s filed under Weddings and tagged Boutonniere, Bride, Bridesmaid, Floral Design, Flowers, NYC Weddings, Purple, wedding bouquet. Bookmark the permalink. Follow any comments here with the RSS feed for this post. Newer: Summer Wedding – A New Bridal Trend!